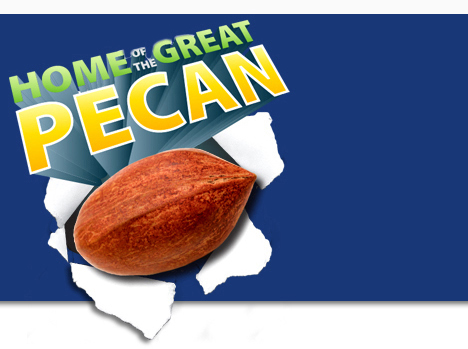 Stephen Bittrich's Home of the Great Pecan is the most delightful new comedy I've seen in a long while. Under the expert and simpatico direction of Hamilton Clancy, at The Drilling Company's intimate Upper West Side theatre, Bittrich's play spins an outlandish tale of UFOs and romance in a small Texas town. At the center of this madcap story is Tammie Lynn Schneider. She's been engaged to Greeley Green for nearly two years now, but she's starting to hear rumors (from her best friend Rosy and from her employer, beauty parlor owner Sonja) that Greeley is unfaithful. Is he letting women drive his truckthe truck he cherishes above all else in the worldin hopes of getting something in return from them? Tammy wants to get married, and she wants Greeley to pay more attention to her than to the darn truck. Oh, and she thinkswell, she knowsshe saw a UFO recently. Meanwhile, Rosy is suddenly being wooed by the town's hyper-charismatic and hyper-hypocritical preacher, Reverend Pat. Young Priscilla Rottweiler is obsessed with being this year's Pecan Queen at the town's annual parade/shindig. And Sheriff Bart and his brand new deputy, Diggity, are trying to solve a huge crime: the town's crown jewel, so to speaka giant pecan made of concrete weighing a quarter of a tonhas been stolen. At first glance, you might think that Bittrich has gathered all these larger-than-life, dizzyingly archetypal characters merely to trot them out for their own sake. And he'd certainly be giving his audience a grand time if that were all he had in mind, not to mention the delicious romp he's providing for his more than capable cast. But there's more here than surface: every one of the balls Bittrich is juggling at his outrageous act one curtain gets caught neatly by the finale an hour later. No loose ends, no quick saves. And there's even a message or two to take home and savor. I loved spending time with these folks. In addition to the ones I've mentioned, there's Ed, Greeley's best friend, who delivers an unexpectedly articulate speech about the nature of religion, seemingly out of nowhere. There's Francio, the gay Mexican kid who likes to hang out at Sonja's parlor (she's the only one in town who seems to actually understand him); and there's Chucky Connors, an angry young man whose family has just moved to Texas from up North, who is chided as a "homo" because he has an earring and who is immediately the first suspect when the big pecan goes missing. And there's Les, the clueless hardware store proprietor, who, when Chucky asks to buy some fertilizer because he's making a bomb, helpfully offers to sell him a load of dynamite instead. I hate to say much more lest I give away some of Bittrich's rich surprises, and it would be terrible if I did that. Let me just say that the thing whips itself up to a frenzy by the climax of Act Two where a kind of surrealism trumps, well, everything you thought you were expecting. 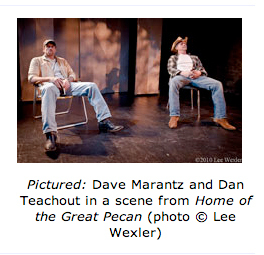 Most of the theatre I've seen so far in 2011 has been super-serious, so Home of the Great Pecan, which is loaded with laughs, is particularly welcome right now. Check it out: I think you'll have a good time. "In the end, that script shines through, thanks to plenty of laugh lines, bizarre predicaments and wild characters." "Last year I saw 63 plays... this was the first play I saw this year since I'm off to a slow start... of the 64 plays... I put this in the top five for theater as well as entertainment. There are many plays out there that are of a serious nature but not many make you smile and laugh as this one did. A MUST SEE!"